A perfectly manicured, green turf grass or lawn has been a status symbol since the Industrial Revolution. Everyone could finally afford to have a lawn, not just wealthy estates. But at what costs? A manicured lawn requires a lot of money, chemicals, energy, and resources to maintain. Many of the lawn chemicals we apply have negative impacts on human and pet health, our waterways, wildlife and surrounding plants. Maybe it’s time to join turf grass anonymous and follow the 12 step program below, in exchange for a healthier world! Ignore the media and advertisements that say we need a perfect, manicured weed free lawn or the claims that lawns are environmentally friendly. View the documentary “A Chemical Reaction” by Paul Tukey. Learn to live with a few lawn weeds. Many lawn weeds are beneficial to bees and butterflies, as explained in the article Why can’t weed be friends? In nature, diversity equates to health, so to try to grow a monoculture of lawn is against the laws of nature and requires chemical warfare to achieve. Understand the impact of fertilizers or nutrient pollution on our waterways and soils. Fertilizer run-off from our lawns enters our local rivers, which goes into the Mississippi, then the Gulf, and eventually the oceans, creating Dead Zones. Have your soils tested first to check if it even needs fertilizer. Don’t assume it does. Learn to maintain your lawn organically. There are many organic lawn care resources, below are just a few. More organic lawn companies will be available, if you demand it. 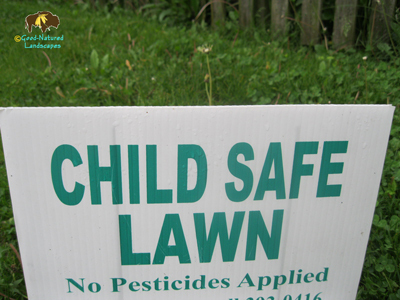 Midwest Pesticide Action website: – Check out factsheets and Natural Lawn Care Calendar. Start using a reel, electric or solar lawn mulching mower, electric leaf blowers, electric leaf vacuum, or hand rake.Gas powered mowers and blowers generate more noise and air pollution than a car. Mow higher. Allow lawn to go dormant during droughts. Conserving a precious resource like water during a drought is more important than a green lawn. Most importantly, convert more areas of lawn to wildlife habitat gardens, and edible gardens. Not only will nature benefit, but we humans benefit, receiving ecosystem services for free and saving us millions of dollars. Ecosystem services http://www.teebweb.org/resources/ecosystem-services/. Hire a environmental landscape professional such as Good-Natured Landscapes to design a landscape with less lawn. 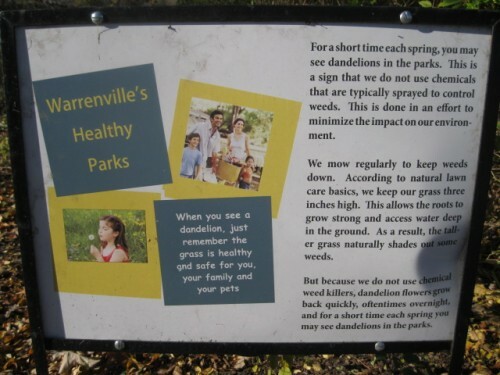 Work with local officials to reduce lawn and encourage organic lawn care, especially at parks and schools. 10. Be the inspiration, help others – put out yard signs, handouts, give yard tours and educate your neighbors. Never be brash when talking to others because most times folk just don’t know why or how to change. Compliment or thank a neighbor who has violets, dandelions or clover in their lawns. 12. Hope some day organic lawns with some weeds will become the norm, not the exception. More importantly, let’s hope there will be a lot less lawn and more habitat to benefit people, pets, wildlife, and waterways. BTW: Turf Grass Anonymous is not a real organization, but just a term used here to get a point across in this article. Well written and provides a wealth of links and references for learning more about how to have a healthy lawn. I’m now feeling better about the oodles of dandelions in my lawn, way too many to dig out so I’m going to enjoy the yellow and maybe cook up a few. Update 6/30/15 The city I live in sent me a citation because someone complained about my weeds and lawn. I have beautiful clover blooming throughtout my lawn right now. Also, my native plants are flourishing, and they have many benefits,as listed on the “about” page of my website. I called the city to ask them to meet with me to show me which plants are weeds. After explaining my native plants and lawn to them, they did not fine me, but they did say I should not have certain lawn weeds like dandelions because they spread. 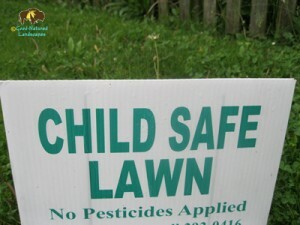 It’s impossible for me to have a weed free lawn because I prefer not to use harmful pesticides. Plus many weeds are beneficial. Read my blog “Why cant weed be friends”. Do others get a citation when using harmful pesticides, overfertlizing or other landscape practices which are detrimental to our health and environment?